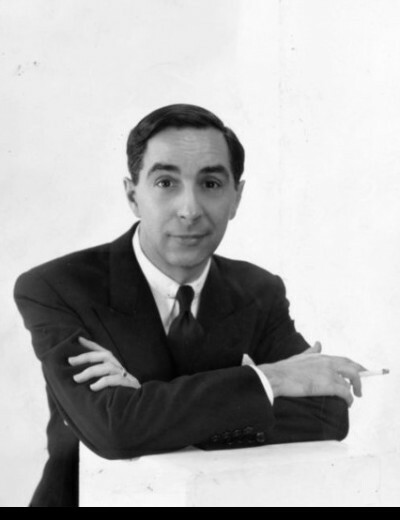 Norman Norell was born on April 20, 1900 in Noblesville, Indiana was an American fashion designer, known for his elegant suits and tailored silhouettes. The son of a haberdasher, from early childhood Norell had an ambition to become an artist. 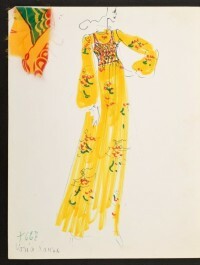 After spending a short period at military school during World War I, he studied fashion design at the Pratt Institute. In 1922, he joined the New York studio of Paramount Pictures where he designed clothes for Gloria Swanson and other stars of silent movies. He then worked as a costume designer on Broadway, making the costumes for the Ziegfeld Follies and the Cotton Club, as well as for the Brooks Costume Company and for wholesale dress manufacturer Charles Armour. In 1928, he was hired by Hattie Carnegie and remained with her until 1941. In 1943 Norell won a Coty Fashion Award and became a critic at Pratt Institute fashion department, where he was previously a student. Shortly afterwards Anthony Traina invited him to form the fashion company Traina-Norrell, with Traina looking after the business side and Norell the fashion side. By 1944, Norell had launched chemise dresses, evening dresses, fur coats, sequined evening sheaths, fur slacks and empire-line dresses. From his early years with Hattie Carnegie, Norell learned all about meticulous cut, fit, and quality fabrics. Regular trips to Paris exposed him to the standards of couture that made French clothes the epitome of high fashion. Norell had the unique ability to translate the characteristics of couture into American ready-to-wear. Today, he is considered by many in the world of fashion to be one of the foremost fashion designers in US history, on a par with the legendary French couturiers. Simple, well-made clothes that would last and remain fashionable for many years became the hallmark of Norman Norell. He gained a reputation for flattering design while Traina, whose well-heeled clientéle appreciated the snob appeal of pared-down day clothes and dramatic eveningwear. He did inspect each model garment individually, carefully, in the tradition of a couturier, and was just as demanding in proper fabrication and finish. Glittering paillettes, which were not rationed, would be splashed on evening skirts—paired with sweater tops for comfort in unheated rooms—or on coats. Later, the lavish use of all-out glamor sequins evolved into Norell's signature shimmering "mermaid" evening dresses, formfitting, round-necked and short-sleeved. The round neckline, plain instead of the then-popular draped, became one of the features of Norell's designs of which he was most proud. He used revealing bathing suit necklines for evening as well, with sable trim or jeweled buttons for contrast. Variations on these themes continued throughout the years, even after trousersuits became a regular part of Norell's repertoire. Striking in their simplicity, Norell suits would skim the body, making the wearer the focus of attention rather than the clothes. Daytime drama came from bold, clear colors such as red, black, beige, bright orange, or pale blue, punctuated by large, plain contrasting buttons. Stripes, dots, and checks were the only patterns, although Norell was credited with introducing leopard prints in the 1940s, again, years before they became widespread in use. Norell's faithful clients hailed his clothes as some of the most comfortable they had ever worn.